We’d love your help. Let us know what’s wrong with this preview of Serious Play by Michael Schrage. To ask other readers questions about Serious Play, please sign up. This book is supposed to be interesting but ended up as a fairly poor read, because it is littered with snippets of case-studies rather than full-blown detailed case studies. And these snippets does not total up to a statistical case to convince me. A lot of the ideas were taken from software engineering and computer science, e.g., genetic algorithms, and thus (being in the line myself) must be taken with a heavy dose of skeptism. Some of the example cited like Boeing weight-budget economy is in This book is supposed to be interesting but ended up as a fairly poor read, because it is littered with snippets of case-studies rather than full-blown detailed case studies. And these snippets does not total up to a statistical case to convince me. A lot of the ideas were taken from software engineering and computer science, e.g., genetic algorithms, and thus (being in the line myself) must be taken with a heavy dose of skeptism. Some of the example cited like Boeing weight-budget economy is interesting but requires a more in-depth treatment and that's why it's 2-stars and not 1. The other interesting aspect of this work highlights the idea that if the models do not cause controversy, the models are not looking at the right set of assumptions. In other words, models that are not challenged are not exploring the right part of the space, and as such are useless before they provide any kinds of results. This reminds me of other research that suggests that good experimental design yields experiments that “fail” about half the time. Experiments after experiment that prove som The other interesting aspect of this work highlights the idea that if the models do not cause controversy, the models are not looking at the right set of assumptions. In other words, models that are not challenged are not exploring the right part of the space, and as such are useless before they provide any kinds of results. This reminds me of other research that suggests that good experimental design yields experiments that “fail” about half the time. Experiments after experiment that prove something we already know are not terribly useful and suggest that the limits of the system in question have not been tested. The corollary to this question is, who stands to lose? Identifying the people/organizations who stand to benefit from a given prototype creates a context for the prototype. 2. Decide what the main benefits should be and measure them. Rigorously. Models and prototypes that are not built for a purpose can become beasts that exist simply because someone created them. A model or prototype is built for a reason. Anything beyond that should be a new development project. 3. Fail early and often. As always, mistakes made early in any development are cheaper to fix than those made later. Failures are also useful to help find the limits of the system being modeled, as mentioned above. 4. Manage a diversified prototype portfolio. It's best to have several types of prototypes, which are managed and used to explicit ends. 5. Commit to a migration path. Honor that commitment. 6. A prototype should be an invitation to play. The sign of a good model is that people play with it. The sign of a great model is that it plays people. 7. Create markets around the prototypes. To manage the work, there needs to be a system to encourage people to play with the models and make changes. Restrictive market rules will discourage play, but unrestricted access may encourage noodling for no reason. The central theme of the book: models are meant for playing, testing ideas, creating conversations, and simply working out problems that can't be solved without some representation (physical or electronic). 9. Determine the points of diminishing returns. How many models is enough? Is the limit on models only specified by time, or is it also the number of models run? The perceived benefit to the customers? 10. Record and review, relentlessly and rigorously. The models and prototypes create conversations. Improvements happen from model to model. This information needs to be recorded to do the best job of managing the work around the models. The book also warns that modelers need to be aware of who else gets to play with the model, and who else gets input to the model. Schrage's view is certainly slanted toward getting input from as many stakeholders as possible, as early as possible. Some useful insights but goes all over the place and mixes prototyping and simulation. 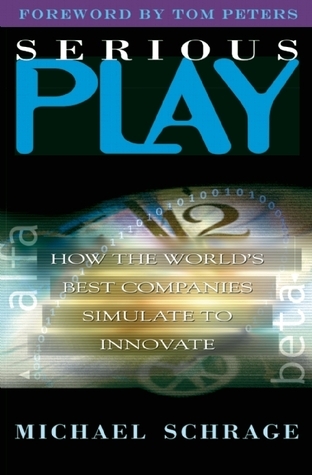 The chapter on metrics seems to undermine the whole concept of serious play. Rather outdated now, of course, and the examples didn't all stand the test of time. I really like the concepts here about innovation, but the book is quite dense...it might take me a while to finish....I didn't finish...I may pick it up again later. On the role of modeling and simulation in generating business innovation. Excellent treatment of the reasons for, and pitfalls to be encountered in simulation modeling.